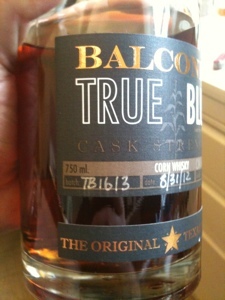 Balcones Distillery is doing wonderful work lately. Its core expressions of Baby Blue, True Blue, Brimstone, Texas Whisky, Rumble, and Rumble Cask Reserve are among the best craft spirits being made in the vibrant and effusive US craft whisky movement. It's a group of spirits marked by tremendous innovation in terms of mash bill, barrel management, and production methods. More importantly, it's a group of spirits with a shocking level of maturity and refinement given their young bottling age. I had a wonderful opportunity to meet with Chip Tate of Balcones Distillery this last weekend and, as Chip calls it "Geek out" about whisky. "Geeking out" means getting into the technical details of the artistry of whisky making - including the empirical science behind some of the concepts. For example I asked about the design of Balcone's famous hand made copper pot stills and what criteria he used. Chip said he did a mathematical analysis: to determine turbulence versus laminar flow he calculated the Reynold's number for the shapes he was considering. We discussed flavors and the chemistry behind them. For example while tasting a fine craft East Coast bourbon from a different distiller (Geeking out involves drinking a range of interesting spirits and discussing them) I commented on an acetone flavor note. Chip identified this note - often found in Bourbon - as Ethyl Acetate, a primary esther composed by the chemical bonding of acohol plus organic acids. The acetate from acetic acid and ethyl from ethyl alcohol. And while every Bourbon has Ethyl Acetate to some extent - the degree to which is appears emphasized has to do with the richness of other flavor compounds to balance it. The conversation ranged over other chemical compounds which appear as flavor components. For example: Butric Acid (a sort of baby puke note in some bourbons), Acetic Acid, (the vinegar in bourbon). Or Nitrosamines with a characteristic flavor formed of sulfur and peat combined via heating. I asked about water and Chip made clear that Balcones uses filtered municipal water prior to distillation and Spring water post distillation. We talked yeast and Chip discussed how careful yeast selection at Balcones gives stonefruit, peach, ripe pineapple and banana notes. The discussion of yeast lead to a discussion of the life and work of Jean De Clerck - Belgian brewer scientist / monk. Following Chip in a conversation like this is dizzying and exhilarating. Allison Patel, The Whisky Woman (who works with Chip as a brand ambassador as one of her many hats), had warned me to bring a notepad when hanging out with Chip. Man, she wasn't kidding. We discussed barrel management and rapid maturation. The use of small barrels is a big trend in craft distilling that has become a controversial topic lately. Buffalo Trace released the results of an experiment with small barrels where they found the spirit over oaked and declared small barrels a failure. Chuck Cowdery wrote an article which he expanded into a book reiterating the argument and concludes that rapid maturation tricks can make interesting spirits, but not good bourbon. In the book he looks at some (not any Balcones products however) and damns them with faint praise. Others, such as In With Baccus, have ridiculed the experiment as so obviously flawed that its clear intent is marketing against craft distillers (read it by following the link immediately above - it's hilarious). Balcones uses small 20 liter (5 gallon) yard aged white oak casks to accelerate wood extraction. The yard aged part is important because kiln drying harshes the wood. Yard aged wood has more sweetness of the wood sugar left in the wood - and this shows clearly all over the Balcones line. Small barrels such as these are, according to Chip, hard to use. He likens managing maturation in them to "trying to gently and carefully cook a steak on an extremely hot fire. You have to pay attention or they'll burn". Among the really exciting things Chip is doing is empirically testing the differences in flavor in maturation in small barrels versus large barrels. The differences are apparent, but are are far smaller than you might believe (tasting notes below). Balcones succeeds in making very polished finished spirits using small barrels which appears to blow the argument out of the water - but to be fair to Cowdery, nothing Chip makes is quite "Bourbon" in either the legal or traditional sense. What Chip is doing is unique to Balcones. Chip uses both small 5 gallon and large 60 gallon barrels in his production process, but he uses special yard aged American white oak casks that have been exposed to freezing cycles in Missouri winters to condition the wood. A number of the experiments that Chip is currently doing involve bespoke barrels with special woods to achieve special flavor signatures. Among casks aging now are ones made of a spicy Eastern European oak, Quercus Robur. 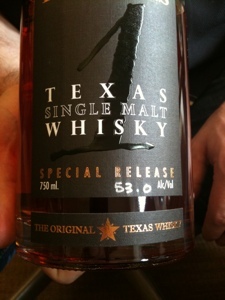 In the future, Chip informed me, watch for Texas Live Oak bespoke casks. Staves of this wild wood that has never been used for whisky production are yard drying on the roof of the distillery in Waco and will be transported by car roof to Reynold's cooperage in Missouri where winter freezes and strong seasonal changes can properly cure the wood according to Tate's specifications. Chip is a fertile intellect, and has thought, researched, and calculated intensively in building his stills, developing his barrel management techniques, and honing his mash bills and expressions. As I quickly discovered, Chip hasn't stopped or even slowed down in any of these domains. He is continuing to experiment with materials and tweaks to his existing expressions and he is ambitiously developing new ones. 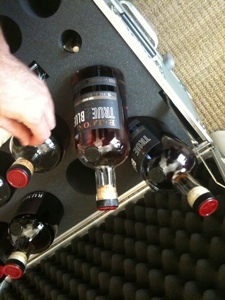 On this trip to New York, Chip brought a rockstar roadie's custom travel case loaded with bottles of samples from single casks selected for awesome flavors, and examples of in-process experiments which illustrate his thought and creative process. Chip has been traversing the country doing this. In fact, I posted about his previous trip to New York back in June where he poured many of these special experiments and selected casks. Chip is a scientist, and he's an artist too. But he doesn't seem to have an insecure bone in his body and he doesn't suffer from the "you can't see it til it's finished" affliction of some artists. 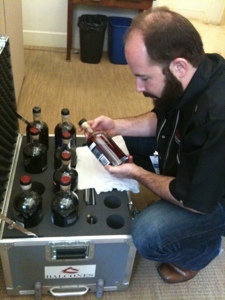 Among the things he brought was a bottle of his new rum experiment - just under a scant 2 months old. All over town Chip poured this for everyone - eager for feedback. The immature rum is incredible, BTW. A nose full of buttered toffeed popcorn, intense confectioner's sugar on the entry and a lush mid palate bloom of Maillard reaction butter-cream-cane-sugar caramel cooking in the pan. I think part of the reason Chip is so easy pouring with this very young experimental liquor is that it's good and he's proud of it. But another part of it is that Chip is evangelizing why it's good. 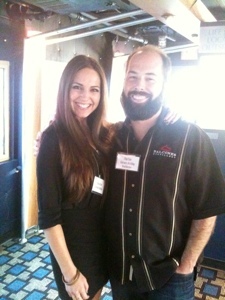 It's no accident that Balcones spirits taste so good so young. It's no accident that they have big bright sweet openings full of confectioner's powdered sugar - seemingly no matter what's in the mash. It's no accident that so many are loaded with rich oak vanilla flavors and oak perfume and incense filigree at an age that many other distillery's products are weak, insipid, rough and raw. Chip wants to explain, scientifically, to you why it's no accident - but even more he wants to show you, empirically. My experience Saturday showed me that Chip has a scientific rationale for each phase of the process and is deliberately crafting his spirits to hit a flavor profile he desires. My first instinct is to look for holes in a any attempt at applied science in such a complex topic. There were moments (particularly when the conversation was going over my head) when I wondered to myself whether maybe Chip might be a fast talking con man. 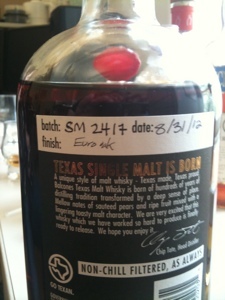 Yet, the proof is in the glass and Balcones has achieved extraordinary success. I'm not just talking about awards (of which there have been many - including Gold at SF and the first Icons of Whisky in the category of Craft Distillery) . I'm talking about the unmistakable presence of a clear house style to Balcones' products - a sense of balance and a flavor signature that spans disparate mash bills. Even more convincing there is a progression over time. What I'm tasting in these new special casks and experiments is a movement towards greater refinement and even greater fidelity to Chip's aesthetic and vision. In a nut shell, and very broadly, the house flavor signature of Balcones runs something like this: a nice nose but the main action is on the palate where you always get a sweet and explosive opening with a powdered confectioner's sugar palate entry and plenty of vanilla floral notes. The mid-palate expansion is richly flavored with the aspects of whatever is in the mash, but is generally off-dry. This balances the sweet of the entry. This is where the august quality comes in - where the best Balcones spirits drink like high end cognac or top tier Scotch. The finish has plenty of oak, with sandalwood incense perfume and sometimes the full blown patchouli you see in Cognac. The fact that Chip regularly gets this flavor profile and is getting it more and more dialed in as he hones his craft proves, to me, that his science is real. A con man can fake out your mind, but not your palate. What's happening in the glass here is incredible and real. The fact that he achieves all this with spirits that are under 3 years old in the wood shows me that, in addition to being an artist and a scientist, he is, effectively, a genius. There is a huge expansion going on all over the whisky world with new distilleries popping up. Joanne McInnis recently posted a moving blog post about personal growth, people following their dreams founding distilleries, and making young vibrant spirits worth drinking. The article is, in particular, a review of Mackmyra The First, but other young whiskies such as Kilkerran, Kilchoman, and Penderyn are mentioned. Balcones is a worthy example of a new distillery doing great things with young spirits - and is part of a larger trend in the whisky world in this direction. But the rapid maturation results Chip is getting are way beyond those examples. Only such tropical high heat rapid maturation paragons as Amrut and Kavalan are in this league and Balcones deserves to be mentioned in the same breath. As part of our "geek out" session we did some dramming of various specially selected casks. Aged in an Eastern European oak wood with a unique flavor profile, Quercus Robur, for 6 months and for about 8 months to a year in American White Oak. Palate: Rich confectioner's sugar sweet on entry with floral vanilla and vanilla butter cream icing trending into a rich apricot citrus fruit compote at the end of the entry. The mid-palate arrives with a potent expansion bringing a major palate shift to filigreed oak sandalwood perfume and cinnamon-like heat from oak spiciness. The finish is lingering with the slow burn of the Quercus Robur's heat, oak tannins, and a bit of herbal bitter like hops. Big and sweet, with enormous flavor amplitude, but a refined and complex flavor mix with some major shifts and complexities as it moves across the palate. It's not finished yet, but already it's one of the finest American craft spirits I've ever tasted. Nose: Gentle vanilla cream with floral esters. A regal and Scotch-like gentle citrus tang melds with the floral vanilla and musk and oak. The confluence of floral sweet, jammy citrus and oak perfume puts me in the mind of mature Glenrothes or Mortlach. Palate entry is intensely sweet with powdered confectioner's sugar with an effusive explosion of vanilla and camellia floral notes. The mid palate expansion has a glow of spirit heat with white pepper and the emergence of gentle oak tannins. Butter toffee Maillard reaction caramel notes join with the fading sugars and emerging oak spice on the turn to the finish. The finish is malty sweet with tannin squeak and herbal bitter. Just lovely. It's a clear malt whisky with the floral deftness of Scotches in the 10-15 year age range, but also the intense powder sweet entry so characteristic of Balcones and a big big flavor amplitude with aggressive wood spice and citrus notes that read a bit of bourbon. 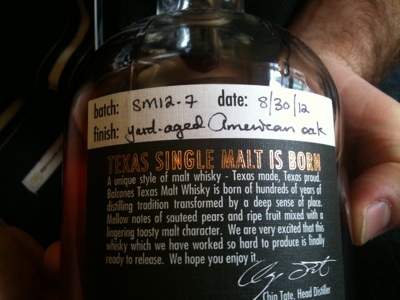 This is a unique flavor profile that is completely American and utterly Balcones. Less an experiment than just a really awesome barrel. I have a note here that says "Lactic Corn"
Nose: traces of acetone waft above a richly honeyed deep plum and nectarine fruit compote with complex oak perfume and mixed baking spices. The oak perfume is mostly sandalwood and hatbox wood, but there is some pure Indian incense sticks going on too. 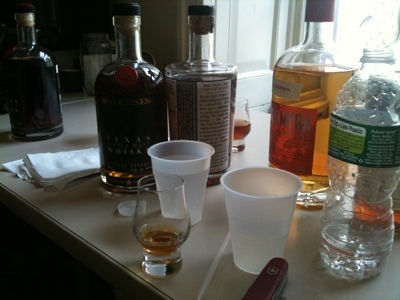 The palate entry is utterly explosive with the highest amplitude confectioner's sugar (except perhaps for Cask 1200). But it's not just the powder sweet here. It's the sweet in a big rich complex matrix of vanilla, earthy blue corn notes, orchid florals and herbal notes. The midpalate expansion brings heat and spice and a new fruit essence to the sweetness it's a sweet and earthy fruity note. It's a bit hard to place so vivid - but it's blue corn all the way. It has a rancio-like cheese rind quality in the waning of the sweet that reads as august and majestic haute cuisine to me. True Blue is true to its nature. It is blue corn - true and through and through. At the turn the oak imposes itself as a pure incense influence. At the turn to the finish the sweet waxes into an herbal bitterness of anise, malt. But these are all facets of the blue corn flavor - reflecting around the intense concentration of flavor elements that marks this remarkable cask. Just titanic amplitude. Sweet, complex incense notes, spice, wood, heat and tannins. It hits hugely on all cylinders. This is an American classic. Totally original and utterly delicious. In Rumble Cask Reserve, Rumble (fermented honey, turbinado sugar, and figs) new make is aged in 20 liter barrels and then blended to large barrels to finish maturation. This particular cask has received extra maturation. Color: lovely amber with golden and reddish glints. Nose: floral orchids, lillies, and iris with jammy citrus apricot / orange. There is oak influence, but more mellow and relaxed than the usual Rumble Cask Reserve. Palate: Entry, big powder sugar, with some regal herbal bitters. Regal citrus apricot fruits in an off-dry presentation. Musky, Texas dust flavors at the mid-palate expansion along with spirit heat white pepper. 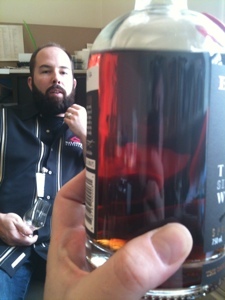 At the turn to the finish the sweetness fades and anise, and cherry malt slowly surface. 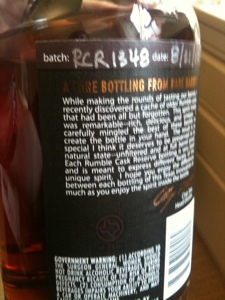 This is clearly Rumble Cask Reserve in every detail. The additional maturation adds a roundness and a polish. 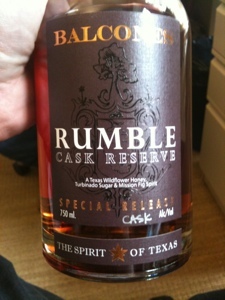 This provides a peek at what old Rumble Cask Reserve may taste like in the future. Brimstone Cask 1200 - The "Burned Barrel"
The Burned Barrel was here too. We didn't taste it that day - but did the following night at a special dinner (a post yet to be written). Brimstone 1200 is perhaps the richest and most astounding flavor in an American Craft spirit, and, with the exception of Stagg & Weller from the BTAC, perhaps in all of sprits. Nose: Cognac caramel and chaparral char: Putty, mesquite char, citrus, apricot, intense sweet. On the palate 1200 is all the huge powder, dust, ash and chaparral smoke glory of regular Brimstone, but with dramatically richer caramel sweet, bigger amplitude of flavor, and a massively complex sandalwood incense on the finish that lasts and lasts. 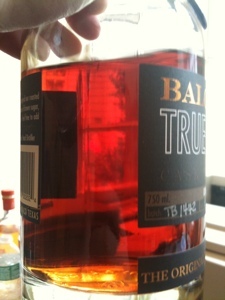 True Blue Cask 1442 Large Barrel Blue Corn experiment. True & Baby Blue's 100% blue corn mash bill distillate are normally aged in small (5 gallon) barrels and then vatted into larger (60 gallon) barrels for barrel averaging to make a batch. This barrel was aged in a large barrel from day 1. 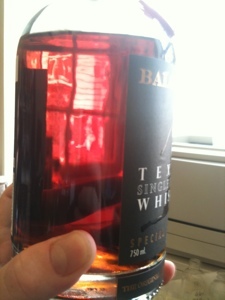 The new make went right into the large barrel in the manner of most mainstream bourbon. While the flavors are a bit rounder and less intense - they are exactly same flavors as regular True Blue. The main effect seems to be the rate of maturation, not the manner, degree, or specific flavor signature at all. 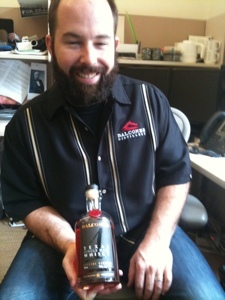 This experiment contradicts the received "wisdom" of a "small barrel flavor signature". It doesn't exist in this empirical experiment. Likely it doesn't exist at all - but emerges out of people mishandling the rapid maturation rate of small barrels. Conclusions: In a nut shell, Chip is a genius. He is a genius because he achieves excellent refinement and maturity in very young spirits using empirical and creative thinking in every phase of whisky production. He's a genius because he proves the artistry of his intent in the common flavor signatures of all these spirits across a wide range of mash bills. He's a genius because the flavors are becoming more and more magnificent with time as he hones his techniques and takes things further. If you had any doubts about Balcones being a distillery to watch, dispel them now and start figuring out a way to get to taste these innovative and excellent American craft spirits. Good God Man! Sounds like you had an AMAZING time. Talk about getting your geek on. Well done Sir! Thanks so much, G-LO. Yes - it was all that. I've been quite enthusiastic about Balcones for a while - but this was an extraordinary moment for me as a fan boy whisky enthusiast. Kind of like going a round with Tiger Woods or playing some pick up hoop with Magic Johnson. Chip is the Walter White of whiskey!